Monsoon has been traditionally associated with greater incidence of conjunctivitis. However, another similar but rare eye infection called microsporidiosis is also being noticed by doctors here. Dr Prashant Jawade of the Vashi civic hospital, said, “We are cautioning and advising people to keep their eyes clean and use clean napkins while wiping their face or hands. 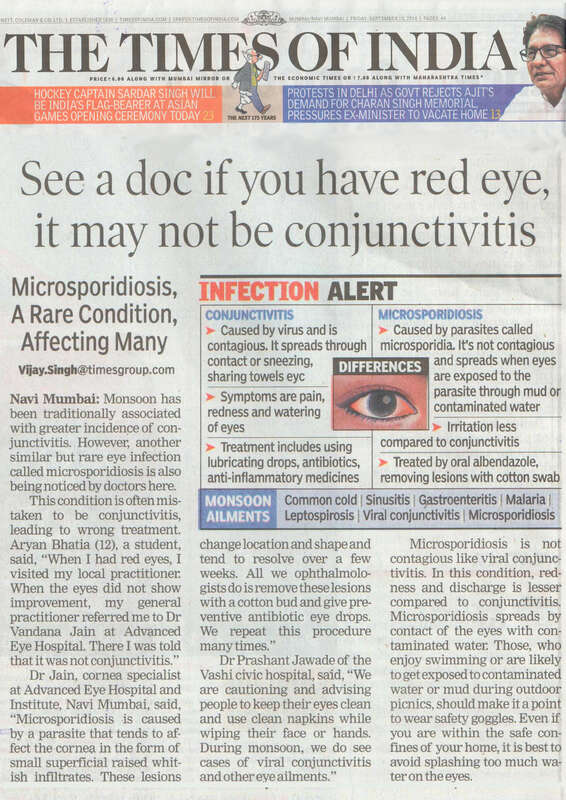 During monsoon, we do see cases of viral conjunctivitis and other eye ailments.“ Microsporidiosis is not contagious like viral conjunctivitis. In this condition, redness and discharge is lesser compared to conjunctivitis. Microsporidiosis spreads by contact of the eyes with contaminated water. Those, who enjoy swimming or are likely to get exposed to contaminated water or mud during outdoor picnics, should make it a point to wear safety goggles. Even if you are within the safe confines of your home, it is best to avoid splashing too much water on the eyes.